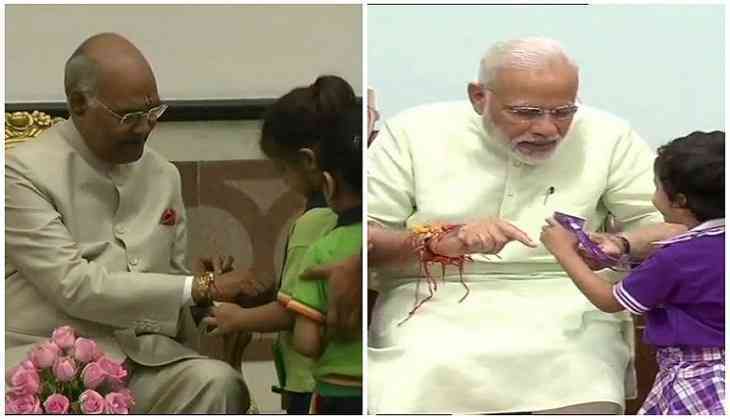 On the occasion of Raksha Bandhan, women and children on Sunday across various walks of life tied Rakhis to the wrist of President Ram Nath Kovind and Prime Minister Narendra Modi. Earlier, both the President and Prime Minister took to their respective Twitter handles to greet the nation on the occasion of Raksha Bandhan. President Ram Nath Kovind sent his warm greetings, saying, "I wish all the countrymen on the occasion Raksha Bandhan. I hope the festival would strengthen the feeling of brotherhood amongst us and would inspire us to become a society where women, especially girls are safe and their dignity is respected- President Kovind." "Wish every citizen of India on the holy occasion of Raksha Bandhan. Greetings on Raksha Bandhan," the Prime Minister conveyed his Raksha Bandhan greetings.